Hello! I am the young boy (no more now,) who came to Trimdon from France for holidays a long time ago in Doctor Caldeira’s. Does anyone remember me? If yes,please be in touch. I am trying to find any relatives of Joe and Mary Rowley, my grand parents. My parents were Bill and Nellie Stewart. I am John (Jack) living in Bradford. I wonder if there is anyone reading this who could help me. I have recently found out about my great-grandfather who was the Waste Manager at Trimdon & Deaf Hill Colliery (c1900?) Photo here. His name was Wilkinson (I don’t know his Christian name) possibly born in 1860s? – his daughter Ruth was my grandmother (born late 1880s? ), she married Albert George Furness (born in 1883), their eldest son was my father – also Albert George Furness (born 1914). 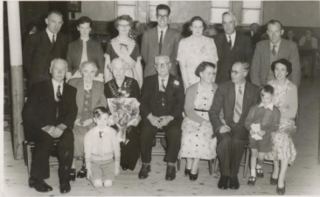 I don’t know anything more about any other Wilkinson relatives I might have still in Trimdon? Do these names ring a bell with anyone? Ms. J Dawkins identified her grandad Jessie Lockett on the right of a picture on the Welch album on our photo galleries.in July 2012. Mildred Thompson, who provided the photos would like to contact you if possible. Please contact the Trimdon Times if this is possible. Subject:Arthur Skelton. A Mr Whitehead is searching for Mr. Arthur Skelton, formerly of Trimdon Grange, who was a Store man at 6 Command R.E.M.E. Workshops, Flagstaff Road, Colchester, in 1956 to 1958 believed to be living in Nottingham. Arthur was a miner in Trimdon prior to joining the army, he will be about 76/77 or maybe slightly older. If anyone has any information about this Arthur Skelton, would they please in the first instance contact Trimdon Times. I’m researching my family history on my mother’s side and I’m trying to locate people who are related to Catherine Bell who was born in 1902 at Trimdon, her father was John Bell and she married John Glaister in 1920. Catherine could have been christened at St Pauls church at Trimdon Colliery as I know a family member was married there. I would be grateful for any help anyone can give me as I live in Stoke on Trent, I have been told that she was known as Kitty, I now believe I have found her on the 1911 census as Katie. Wednesday, June 26th, 2013 at11:30 am. My name is Marion Kendrick (nee Hamilton) and I was born in Trimdon, but moved away many years ago. If you are on this photograph or recognise anyone on it, I’d love to hear from you. Many thanks. Marion K.
What a surprise. Yes, Gladys and Bill were my parents. I immediately remembered your name, and as living at numbers 54 and 55, so we must have been there a few years. I was born in 1939, then left Trimdon School when I was 11 and moved from Trimdon to Wingate – in 1954, if my memory serves me right. Did your Na-Na live in the steel houses? Can’t think why I remembered that and might be wrong. I left Wingate in 1958 to work in the South, returning briefly in 1960 to get married. I became a PE and swimming teacher. My husband is a Wing Commender in the Air Force so we travelled the world and had a wonderful life. Sunday, April 21st, 2013 at10:30 pm. I am searching for information about my Great, Great Uncle Aaron Barratt and his wife Maria (nee Attwood), on 1911 census they lived at Jasper House, Deaf Hill, Trimdon. After spending almost 50 years in Australia they returned to Trimdon in 1959, where Aaron died in 1960. Their nephew, S Cairns is named on the death certificate, is there anyone still living in Trimdon by that name, I would be most grateful for any information, many thanks Jayne Jones.